Cuisinart French Classic 3 Layer Piece Non-Stick Cookware Set $19.97 + Free Pickup at Walmart or Free Shipping With $35 Order. 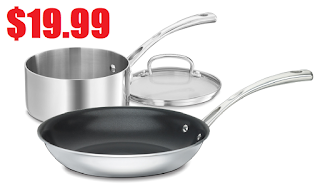 3 Piece Set Includes: 10 inch Non-Stick Fry Pan, 3 Quart Saucepan with Stainless Steel Lid. Very high quality and an awesome price. The skillet alone usually sells for at least $30.